William Wordsworth (1770-1850), English poet, one of the most accomplished and influential of Englands romantic poets, whose theories and style created a new tradition in poetry. 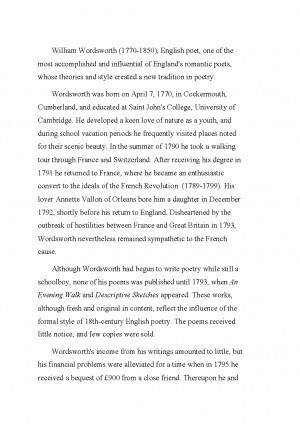 Wordsworth was born on April 7, 1770, in Cockermouth, Cumberland, and educated at Saint Johns College, University of Cambridge. He developed a keen love of nature as a youth, and during school vacation periods he frequently visited places noted for their scenic beauty. In the summer of 1790 he took a walking tour through France and Switzerland. After receiving his degree in 1791 he returned to France, where he became an enthusiastic convert to the ideals of the French Revolution (1789-1799). His lover Annette Vallon of Orleans bore him a daughter in December 1792, shortly before his return to England. 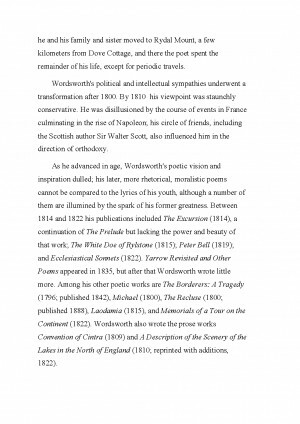 Disheartened by the outbreak of hostilities between France and Great Britain in 1793, Wordsworth nevertheless remained sympathetic to the French cause. 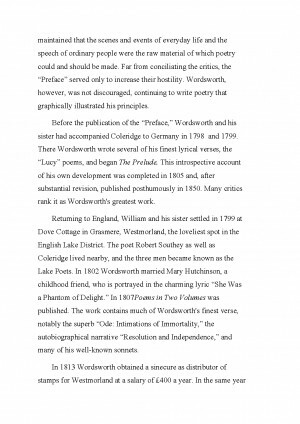 Although Wordsworth had begun to write poetry while still a schoolboy, none of his poems was published until 1793, when An Evening Walk and Descriptive Sketches appeared. These works, although fresh and original in content, reflect the influence of the formal style of 18th-century English poetry. The poems received little notice, and few copies were sold. 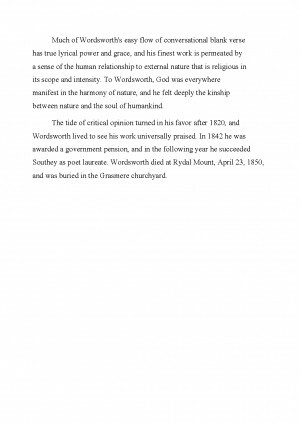 Wordsworths income from his writings amounted to little, but his financial problems were alleviated for a time when in 1795 he received a bequest of ?900 from a close friend. Thereupon he and his sister, Dorothy Wordsworth, went to live in Racedown, Dorsetshire. 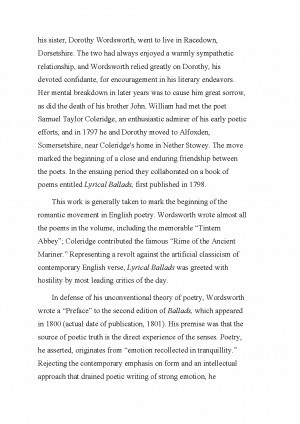 The two had always enjoyed a warmly sympathetic relationship, and Wordsworth relied greatly on Dorothy, his devoted confidante, for encouragement in his literary endeavors. Her mental breakdown in later years was to cause him great sorrow, as did the death of his brother John. William had met the poet Samuel Taylor Coleridge, an enthusiastic admirer of his early poetic efforts, and in 1797 he and Dorothy moved to Alfoxden, Somersetshire, near Coleridges home in Nether Stowey. The move marked the beginning of a close and enduring friendship between the poets. In the ensuing period they collaborated on a book of poems entitled Lyrical Ballads, first published in 1798. This work is generally taken to mark the beginning of the romantic movement in English poetry. Wordsworth wrote almost all the poems in the volume, including the memorable Tintern Abbey; Coleridge contributed the famous Rime of the Ancient Mariner. Representing a revolt against the artificial classicism of contemporary English verse, Lyrical Ballads was greeted with hostility by most leading critics of the day. Descărcarea referatului cu titlul "William Wordsworth" este gratuită. Completezi informațiile din formularul de comandă și imediat după aceea vei primi prin email link-ul de descărcare.